StarWright 0.7.0 - Ion Beams! Today I released StarWright 0.7.0! 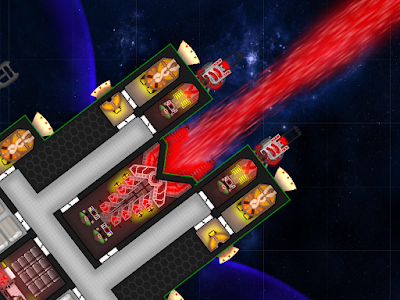 The Ion Beam shoots an extremely powerful (and power-hungry) beam of ion energy that will quickly rip holes in enemy ships. It is currently the most powerful weapon in the game in terms of how much damage it can do every second, and it's particularly effective at sawing ships into pieces. Unlike the other weapons currently in the game, the Ion Beam Emitter is so heavy that it can't be mounted on a turret and thus must be fixed directly to the ship's hull. This means that the ion beam can only shoot in a straight line (as determined by which way the ship is facing), and thus is very difficult to aim with any precision. Firing the ion beam uses a lot of power very fast. If you want to keep the ion beam active for more than a few seconds, you'll need a lot of power being constantly delivered to it. Unlike the other weapons, the Ion Beam Emitter is very weakly armored, making it a potential Achilles' heel through which enemy fire can reach the inside of your ship. While the Ion Beam Emitter is only two spaces wide, it is four spaces deep, three of which cannot be traveled by crew. This may force you to re-think your ship's layout and cause issues with ammo and power delivery to other systems. Please feel free to download the game and post your feedback! Today I released StarWright 0.6.0, which (in addition to a handful of other improvements) features the game's first active defensive system: the Shield Generator! Until today, the only defensive additions you could make to your ship were the lowly armor tiles. Armor tiles are useful for protecting the innards of your ship from enemy fire (and especially from penetrating cannon rounds), but, since weapons and thrusters have to be placed on the exterior of your ship, armor was a limited use in protecting those kinds of systems. The Shield Generator changes that, providing protection for your ship's exterior, but at a hefty cost in credits and power. As you can see in the above screenshot, the shield generator (the purple room next to the big cannon) projects a curved force field in a 90-degree arc in front of your ship. This force field blocks all incoming enemy fire attempting to pass through the arc, while allowing your own shots to pass through unimpeded. The shield only protects against shots passing through its limited 90-degree arc, meaning that, without extra shield generators, you could be flanked from the side where the shield won't protect you. While the shield blocks incoming weapons fire, it does not actually prevent enemy ships themselves from passing through. So if an enemy ship gets close enough that its weapons fire from within the shield's arc, then the shield will do nothing to protect you. Shields use a lot of power while operating. Not only is there a substantial per-second power drain just to keep the shield operating, the shield also loses power quickly as it absorbs enemy fire. And once a shield generator runs out of power, its protective force field will shutdown until the generator can be fully re-powered, leaving a sizable window of opportunity for the enemy to destroy the shield generator or the other systems it was protecting. 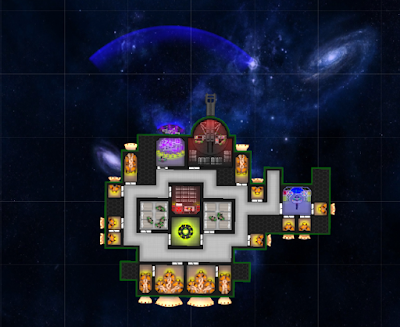 Keeping a single shield generator powered during an an enemy attack can require many crew working hard to carry power from a nearby reactor or power storage. The shield generator itself is very weak and is easily destroyed once its force field shuts down. This leaves a potential weak point in the perimeter of your ship through which enemy rounds can penetrate and damage your internal systems. One mechanic not yet implemented that I'm considering adding is heat buildup. The potential reason for this mechanic is that it's theoretically possible for a ship to have so many shields and enough crew and power to keep them active that you'll never be able to bust through; and if your ship also has impenetrable shields, that could cause a stalemate. A potential solution to this kind of stalemate is to, as the shield takes enemy fire, have it build up more and more heat until, eventually, the shield generator either deactivates or maybe even explodes. I have not added this heat-buildup mechanic because I don't want to make the rules for shield generators unnecessarily complex and less intuitive unless I'm absolutely sure that they're needed. If you find that you're getting into these kinds of stalemates while playing, then please let me know! As always, I encourage you to download StarWright and post your feedback!